The new SharePoint Development Framework was not the only news to come out of San Francisco at Microsoft’s Future of SharePoint event last month — Microsoft Flow and Microsoft PowerApps also made their appearance. These new tools are aimed at increasing business efficiency, particularly in terms of automation. 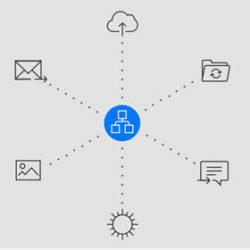 Microsoft Flow allows you to create automated workflows between apps and services to synchronize files, collect data, get notifications, send e-mails, and so on. The twist here is that the apps and services that Flow connects with are not limited to Microsoft and SharePoint environments. Flow can wed Office 365 and SharePoint to over 35 different services, such as Dropbox, Twitter, Outlook, GitHub, Salesforce, MailChimp, and OneDrive. .. and on and on. This isn’t the first time that a company has created a configurable task automation solution. IFTTT has been doing this since 2011 and Zapier now boasts over 600,000 users. The difference, though, is that those services are limited to connections with other social media and SaaS offerings. In the case of Flow, we’re talking about Microsoft, which opens up the world of business productivity software. Flow is not limited to just Web SaaS connections (e.g., Gmail and Facebook). Flow is all about connecting SharePoint, the world’s most popular collaboration platform, with both internal (other Microsoft apps) and external apps. This allows the service automation model to go from being a “cool, trigger-based task automation tool” to a “business user productivity solution” that can actually help people get work done faster. Perhaps going forward, Microsoft will combine Flow with the AI-oriented brains of Office Graph to intelligently suggest workflows based on user profiles. We will be keeping an eye on where the “Flow” goes on this! Move over devs, the business users are coming! Microsoft PowerApps is designed to increase business efficiency via bypassing traditional pathways. The core concept behind PowerApps is this: a SharePoint-integrated solution that allows business users to develop apps for mobile or Web use. PowerApps is marketed as a bridge to app development without the hard work: no coding required! Business users simply log on to SharePoint, launch PowerApps Studio, and then specify whether they’d like to build an app via a template, access specific data, or start from scratch. The PowerApps UI is simple: drag & drop controls and data sources are added to a form-based interface. The end result can be pushed out to a mobile device, the Web, or leveraged as a SharePoint view. A PowerApps-created app has a collaborative open-source feel to it — completed apps can be shared with other users; security groups and recipients can re-share and even edit the app (pending data source permissions). Completed apps are 100% cross-platform and can be published to any device — PC, tablet, phone, iOS, and Android. For Microsoft, the march continues inexorably toward a mobile-first, cloud-first world. The focus is on business users and how they can leverage technology to increase their efficiency and productivity. Flow and PowerApps are the two recent examples of how Microsoft is empowering business users to develop solutions appropriate to their needs. In our SharePoint Development Framework article, we discussed how non-developers could build Pages using developer-created components. Microsoft PowerApps is even more overt, as it’s built exclusively for non-developers. It effectively enables business users to experiment with app creation, a discipline that has traditionally been relegated to IT Departments. Boundaries are being broken and barriers to innovation are falling away — technology is becoming advanced enough to comfortably hide-away its complexities and serve up user-friendly interfaces designed to simplify rather than mystify. As of this writing, Flow and PowerApps are available in public preview.